This month’s Cincom Smalltalk™ Digest is dedicated to our friend and Smalltalk advocate, Jim Robertson. #WaybackWednesday It’s been five years since we lost our friend and #Smalltalk advocate, Jim Robertson. Jim touched the hearts of many people @Cincom and all over the world, and we want to celebrate his memory. How Can PUL Users Receive the Latest Release? 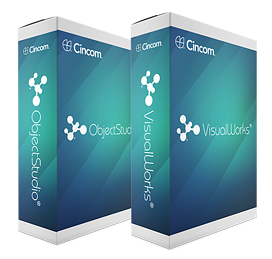 Cincom ObjectStudio 8.9.2 and Cincom VisualWorks 8.3.2 Are Here! Cincom is the leading provider of commercial Smalltalk. Cincom Smalltalk adds value and simplicity to application development software, web application development tools and deployment environments. ObjectStudio is “The Business Analysts Thinking Tool” and is an ideal solution for developing custom applications for Windows®. The value in ObjectStudio is the tools for analysts and developers to work effectively together on a solution in the analyst’s language. VisualWorks is “The Cross-Platform Development Tool” and is the ideal solution for custom, enterprise-level, application development. With VisualWorks, the value comes from having the highest developer productivity and successes in solving large or difficult problems. Both ObjectStudio and VisualWorks share the same core libraries and foundation, which means foundation improvements improve both products. As one of our valued Cincom Smalltalk customers, we’re pleased to offer you this opportunity to request the latest release of Cincom Smalltalk through our Customer Product Request Form. Should you have any questions or problems accessing the request form above, please contact your Sales Account Manager or Cincom Smalltalk Support. ObjectStudio also shares a foundation library and VM, as well as many of the same improvements as VisualWorks. To learn more about these new releases, please see the product release notes. The release notes contain new feature descriptions and descriptions of the ARs and support resolutions that were addressed. If we can assist you in any way, please contact us here. A few years back, the Cincom Smalltalk STAR Team made the decision to limit the maintenance releases of Cincom Smalltalk to customers only, leaving the major releases of Cincom ObjectStudio and Cincom VisualWorks only available as our Personal Use License (PUL) versions. So, if the maintenance releases are limited to customers only, how can PUL users receive this latest release? A valuable program available for this exact situation is the REV Program. The REV program is an opportunity for Personal Use License users to take their passion to the next level and create their own businesses by becoming a Cincom Smalltalk customer. But, what value comes with being a Cincom Smalltalk customer? What benefits do we give customers that a general user never receives with the PUL? This quick, easy way to partner with us and grow your business is only $500 and is a great investment that could pay big dividends as you grow your business. Don’t let another day go by. Let’s grow your business together and take your passion to the next level. Join the REV program today. At Camp Smalltalk 2019 in Charlotte, North Carolina, we saw many great presentations. Cincom’s own Carl Gundel from the Cincom Smalltalk engineering team gave an engaging and instructive presentation. Carl explained how to use new features of Cincom VisualWorks 8.3.2 to create a custom coloring text editor by using the flexible new DocumentEditor and also demonstrated window layout using constraints as an alternative to positioning in the UI Painter. PetitParser was also leveraged in the examples. The purpose of the Hidden Gems Screencast is to give developers who use Cincom Smalltalk some valuable insight into the useful abilities of the products that may not be obvious. In this month’s new screencast, Arden Thomas, the Cincom Smalltalk Product Manager, shares Part One of Object Persistence. Object persistence is about saving and restoring the state of an object. This can be done in a variety of ways, often with a relational or object database. But what alternatives are there and how do they work? That is what this series will discuss, build and demonstrate. Part One will demonstrate a simple, powerful and useful text-based technique that is not widely known. Watch this new screencast below, or click here. As mentioned last month, the 27th ESUG Conference will take place on August 26-30. Smalltalk users from around the world will be coming to Cologne, Germany to attend ESUG 2019 hosted by a German software development company, ZWEIDENKER. As soon as more information regarding hotel accommodations and how to make reservations develops, we will be sure to pass it along. This year the Smalltalks conference will be held at Facultad de Informática, Universidad Nacional del Comahue, Neuquén. Main event: November 13 to 15. The 2019 Smalltalks Conference will be held at Facultad de Informática, Universidad Nacional del Comahue, in the Neuquén province of Argentina. The workshops, tutorials and introductory talks will take place on November 11-12, and the main event will follow on November 13-15. This is the 13th year for the conference that focuses on Smalltalk-based technologies, research and industry applications. The Smalltalks Conference is one of the activities that is organized by FAST (Fundación Argentina de Smalltalk), which is an Argentinian non-profit foundation. With a mission to promote the use of Smalltalk in all areas regarding education, scientific research and professional development, FAST seeks to connect Argentina and the region with the international Smalltalk community. The 2019 Smalltalks conference is free and provides a unique opportunity for showing advancements and new projects that are taking place in the global Smalltalk community. This is also a great opportunity for young developers to acquire experience in presenting their work before an international audience. Customer Product Request Form – For customers and partners with a valid customer number. Cincom Professional Services – Get more information on product upgrades, mentoring, troubleshooting, performance enhancements, migrations and more.